Captain Steve and his wife Page take time in the winter to travel and see what fishing is like in other places in the world. If you are interested in doing some traveling to any of the places listed, let me know and I will try to hook you up. Just call 1-850-380-4101 or 1-850-457-4106 or Email: Captain Steve Jones at bsjones11@bellsouth.net for details. Arizona, Wyoming, Colorado, Montana, Kansas, Missouri Made this trip May of 2007. All on land. Page and I went with some friends to Yellowstone, Grand Canyons, Bryce Canyons, Jackson Hole, and Branson. What a trip. The trip was really not for fishing, but who could go to an area that has the best trout fishing in the world and not want to fish. Of course I went Trout fishing everywhere. The best turned out to be in Branson. I was actually at out there during the wrong time of year. It turned out that the run off period is during the month of May and that is when we went out there. The rivers get all muddy and the fishing is bad until late June. It then stays good until Winter. Anyhow we caught a few in Yellowstone and I hired a guide in Branson who helped me get my fill of Rainbow Trout. It was great. Fished mostly with a fly rod. They don’t like spin casters there too much. We saw some great canyons, mountains, and a lot of wildlife to include deer, elk, moose, buffalo, grizzly bear, coyote, fox, and wolves. The shows in Branson are something else. We saw Mickey Gilley, Fabian, Bobby Vee, Chris Montez, Brian Hyland, and the Chiffons and more. It was great! These guys were still getting up on stage and performing and all are older than me. I have included a few pictures below of the sights. Just click on the thumbnails and see a larger picture. Included are pictures of Elk, Buffalo, Grand Canyons at sunset, Bryce Canyon, Old Faithful and of course yours truly standing on the edge of Grand Canyon. Mexico Made this trip March of 2005. About 50 of us from the Perdido area decided to get away from the Hurricane mess and go to Mexico. Page and I had a great time in Cancun and Cozumel. Curtis Johnson and myself went Bone fishing in Cozumel. We fished with "Fishing Adventures". Capt Gabriel gave us a great trip. It was quite windy the day we went. We got off the ship about 7:00 am and Gabriel met us across the street. He drove us to the other side of town and got us settled in with a guide for a day of Bone fishing. It was really slow. We only saw Barracuda and the wind was blowing so hard that it made it hard to cast. We worked every bank all morning and then moved to another side of the lagoon. It was right before the trip ended when Curtis got the first bite. What a fight! I really wanted one now. We took some pictures and I started casting again. Boom! Curtis got another Bonefish. The only two fish caught and Curtis caught both of them. We did have a few more bites but no more fish. It was a great trip and we got what we went there for. First time catching a Bonefish. We had a great trip. Everything went just as planned. The captain picked us up at the dock, provided a good guide, refreshments, all gear etc., and took us back to the ship. No problems at all. Page isn't too thrilled about what is on her head. To get a inshore trip in Cozumel, the information is below. Marathon Last year (2004) Page and I took our 44 Ocean and took off to the Keys for a couple of months. We were going to fish in Marathon during the big Sailfish run and then go over to the Bahamas. 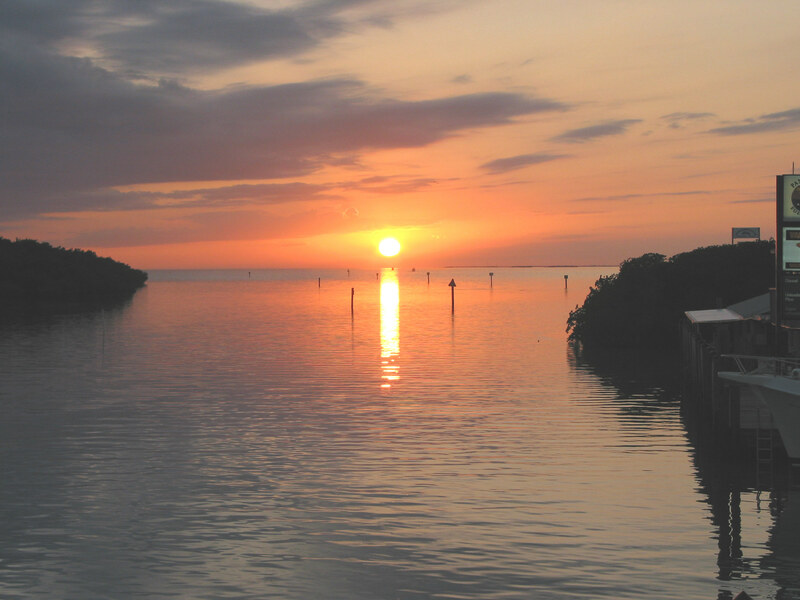 We never made it to the Bahamas, but had a great time in the Keys. 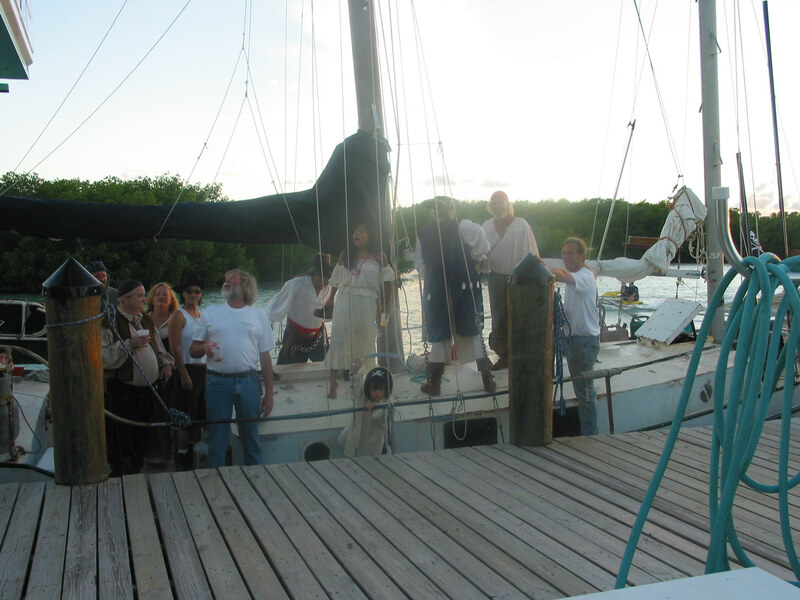 We stayed in Marathon most of the time and caught Sails. It was so nice to leave the dock and be fishing for Sails only 6 miles from the Marina. We stayed at Burdines Marina which is a great place to dock. Plenty of restaurants, and shopping within walking distance. We fished off our boat for the Sails so I would be glad to tell you the local tips in catching fish or can recommend a great Captain if you need one. Had to put these pictures here. 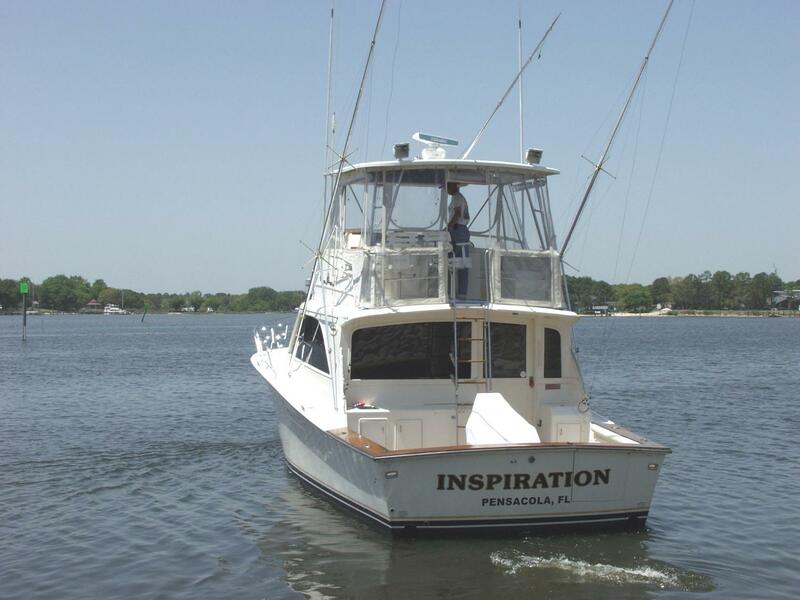 2004 was a great year and we had a wonderful trip on the Inspiration but hurricane Ivan did a number on the boat. We have great memories on her though. Key Largo Page and I decided to go to Key Largo to catch Snook. We had a great trip with Capt Bob. Great Captain! He was real honest about what he thought we could catch and what we would not catch. We ended up with several Snook, Tarpon and a few Jacks and Specks. 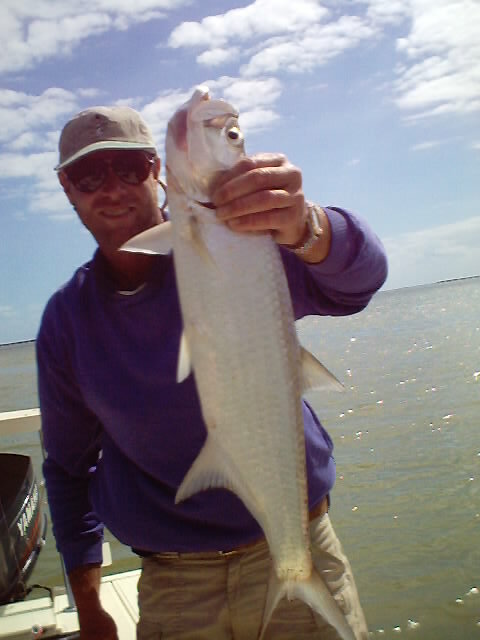 I was very pleased to get the Snook, it was my first. He picked us up right at the dock in back of the hotel we stayed at. Costa Rica There are lots of places in Costa Rica to fish. We fished Quepos because of the big Sailfish run. You can catch 15 to 20 Sails per day when it is hot. The big run is in February and March although you can catch them other months as well. Had a blast, Sailfish were everywhere. Accommodations were within blocks of the water. The country is absolutely beautiful. We visited San Jose and shopped around, Arenal Volcano which is between Guanacaste and Alajuela Provinces, (which we got to see erupt at night), lots of Rain Forest, Rio Pacuare and rode the rapids (22 mile ride) which is the second best in the world. The people and food were great. Check out the pictures below. Puerto Rico I did not get any pictures on this trip but it was a great trip. The Captain and crew were great. We fished out of La Parguera the Southwest coast of Puerto Rico. Wahoo, Marlin and Dolphin. Contact information is below. Website with a growing list of fishing articles, rods, reels, guides, ebooks and directories.